Imagine working out of a space that’s cuddled up with trees. 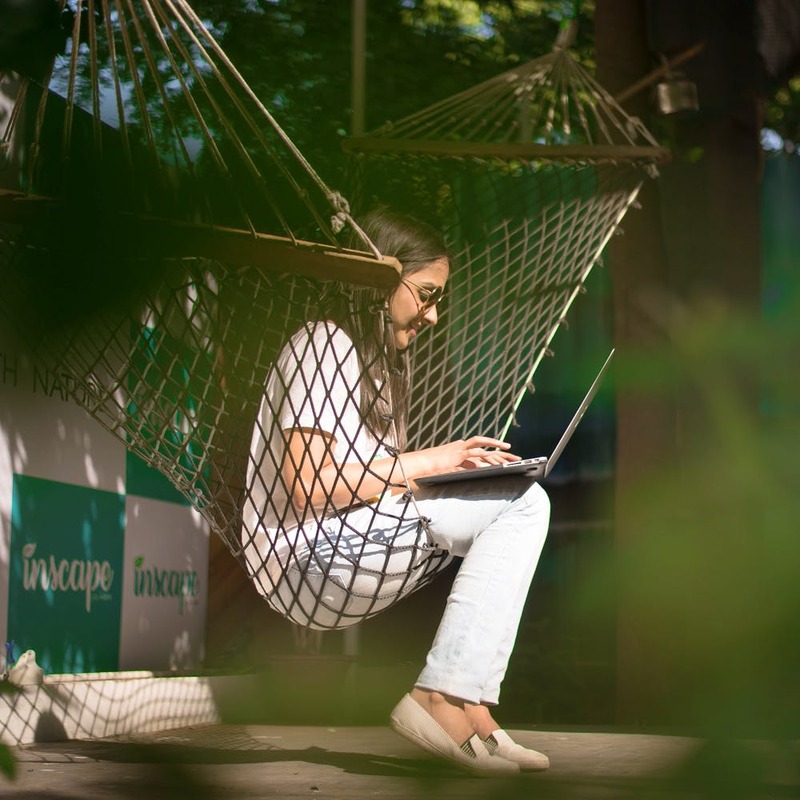 Inscape Co-Work in Koregaon Park is a bungalow turned into a space that’s all about wellness and nature. We moved our office for a day and absolutely loved it. Located in KP’s lane C, the two-storied bungalow is all white and blue. The first thing you walk into is their common area. It’s open air, has a wooden swing you can mount yourself and your laptop on and chairs and tables, where you’d ideally sit down for lunch. But working al fresco is always more fun, right? The first and second floor have rooms that you can book for you and your team. And who wouldn’t want to work here? Each room is bright, roomy and has a window that looks out to trees in the compound. And, all rooms are named after rivers. As the cowork space focuses on wellness, there’s a wellness cafe that serves amla juice, coconut water, lime juice apart from the usual tea and coffee. They also have a reading corner and a hammock you could laze on when you need a break from work. And, the usual amenities like a conference room, printer and every private room has a screen in case of presentations too. On weekends, the common area turns into an event space. So if you’re breaking into stand-up comedy, theatre, spoken word poetry or are into any other performing art, you’ve got a stage ready for you! The packages are moderately priced, like most other co-work spaces in Pune. You can use the space at INR 200 per hour or for INR 500 for a day. For freelancers or solo workers, you can work out of the open space too for INR 7,000 per month. Or take a private room for your team of 5 to 12 persons for INR 7,500 per person, per month. If you get inspired by nature or are a company that wants to promote wellness and put your employees in a space that’s open and green, then this cowork is ideal.